Course textbooks are supplied and included in the course fee. Free linguistic activities in the afternoon. Continuous provision from January to December. Never more than 12 in a group (15 in summer). Competitive and SLIDING SCALE of fees: up to 20% reduction if you stay for 8 weeks or more!. 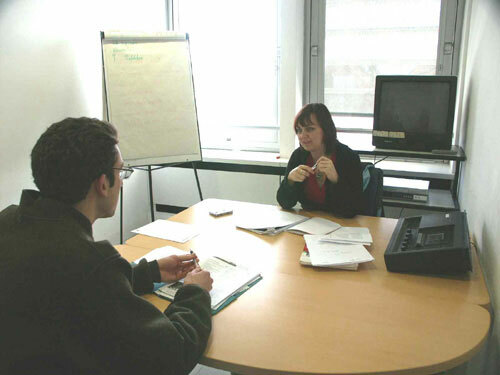 Emphasis is placed on practicing oral skills and on the use of real documents. Methods and textbooks are varied and are regularly updated. Individual study in our multimedia library. French for specific purposes such as written abilities, French for business etc. Work in semi-autonomy (individual course). Improved understanding and communication in a French business context. Learn vocabulary specific to your sector and take part in business meetings with French speakers. Throughout the year for set groups. For universities, business schools, professional bodies. French for specific purposes; European issues, intensive residential courses for executives, etc. Either admit your students on to our courses as individuals. Or design a programme of study specifically for your group. Or design a combined package with general language classes in mixed nationality groups in the morning and a specific programme of study in the afternoon.